So with the success of Avengers, Kevin Feige's Ant-Man movie is a go. Ant-Man is the first of many superhero identities of Henry "Hank" Pym, a founding Avenger (in the comics) and scientist who developed "Pym Particles," which help him shrink to the size of an ant and communicate with ants (hence the name). He also has the ability to grow in size, in which case he adopts the sobriquets of "Goliath" and "Giant-Man," and sometimes he has the power to shrink and fly and throw sting blasts like a yellow jacket, hence the name (wait for it) Yellowjacket. Just look at this picture. Now, the one we're interested in is that last one, Yellowjacket. You see, Hank Pym has a reputation If you ask a comic book fan who's not all that familiar with the character to define him with one word, most of the time you'd get the same answer: "wifebeater." This is because, back in 1981, Yellowjacket hit his wife Janet Van Dyne, the superheroine (and fellow founding Avenger) the Wasp, and somehow has been defined by that moment since. But it's a load of bunk. It doesn't hold up, and it especially doesn't hold up in superhero comics. It's taken out of context, oversimplifies the situation, trivializes actual domestic violence, disregards mental illness, and is unfair to the character and to Marvel Comics in general. Let's work through the sequence of events, shall we? We'll start with how the Yellowjacket persona developed in the first place. 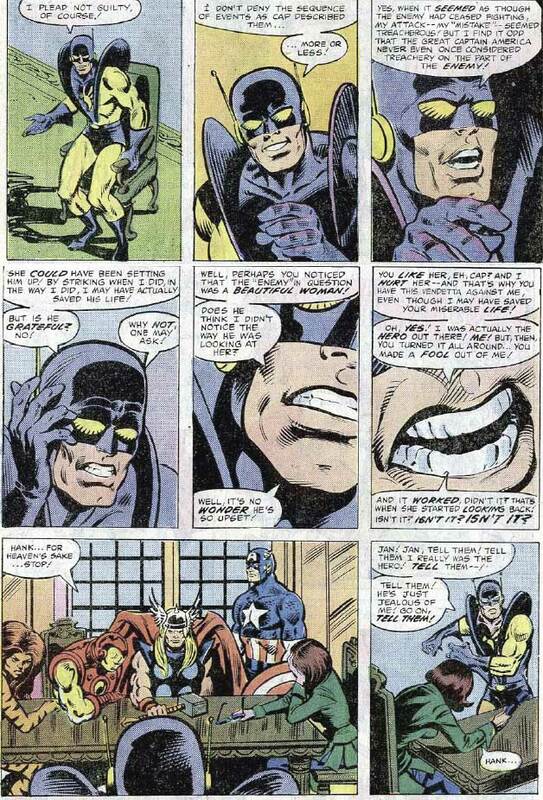 The first time we see Yellowjacket is in AVENGERS #59, published in 1969. Hank Pym is conspicuously missing from the Avengers meeting, and then Yellowjacket shows up, claiming to have killed him. 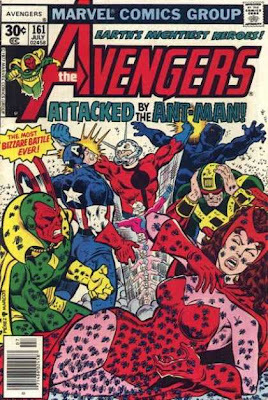 As you can imagine, the Avengers don't take this lightly and they attack Yellowjacket. He manages to escape, taking the Wasp with him as a hostage. And when they're alone, he decides to kiss her. This sets something off in Jan, because when the Avengers come to her rescue, she's decided to marry him. I think you can guess where this is going, but I'm going to recap AVENGERS #60 anyway in a linear fashion, to try to approximate the sequence of events here. 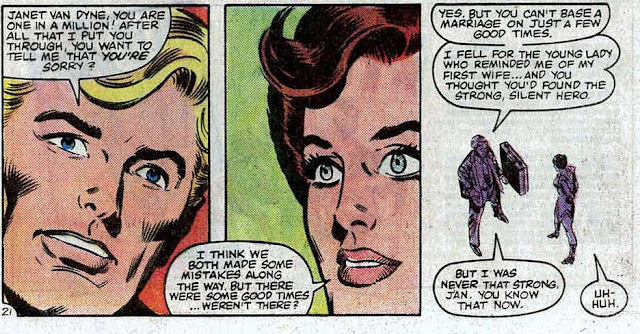 The Avengers are obviously not happy with Jan deciding to marry a stranger who claims to have killed Hank, but Jan justifies her actions as a chance for happiness, because Hank's dedication to labwork always took precedence over their relationship, by her estimation. 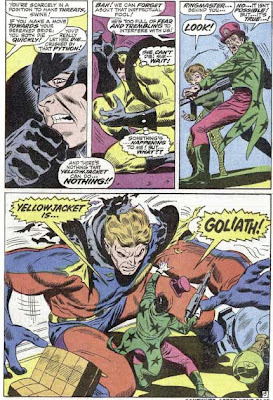 After the wedding, the Avengers are attacked by the Ringmaster's Circus of Crime, and when Jan is in trouble, Yellowjacket is revealed to be Goliath. At the end of the story, they piece things together. 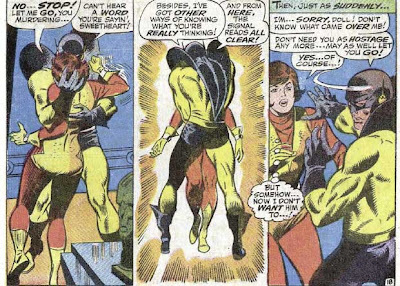 Hank had been exposed to gases that induced "schizophrenia" (it's really closer to dissociative personality disorder) and created the Yellowjacket persona in order to "do away" with his Goliath persona. 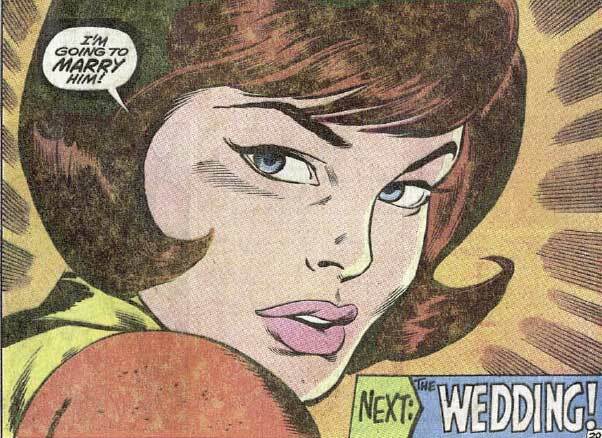 As Yellowjacket, he'd be more mentally prepared to marry the Wasp, and when he kissed her, Jan figured it all out... and decided to marry him as Yellowjacket even when he was still convinced that he was the man who had killed Hank Pym. Um, okay. So basically, what we've got here is a guy who legitimately is convinced that he's someone else, and a girl who so desperately wants to marry said guy that she'll marry him under such a condition. Someone here is screwed up, but I at least know Hank had his brain messed with. What's Jan's excuse? Jan's only excuse here, it seems, is that she was a female Marvel character in the 1960s, when females being superheroes seemed to be enough of a "step forward," but were routinely defined by how much they needed to be around their men. Susan Storm, the Invisible Girl, always waited for Reed Richards to give her more attention, and the Wasp acted as the ditzy socialite that tried to make Hank ignore his research. 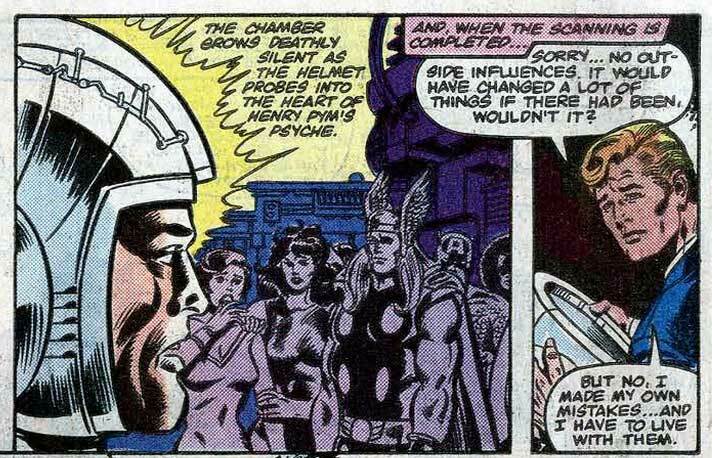 This wasn't writer Roy Thomas' fault — he merely wore an onion on his belt, which was the style at the time. You can argue that the seeds were already there with Hank constantly changing identities (with even two identities — Giant-Man and Goliath — for the same power), but I don't think they planned such things out long-term back then. Half-baked 1960s psychiatry and female characterization aside, future writers took Hank's mental problems and ran with it. Before we get to the infamous slap, I want to reference AVENGERS #161, by Jim Shooter and George Perez. In this story, Hank gets most of his memory wiped out by Ultron (an evil robot that he created), and so doesn't recognize any of his teammates and attacks them. When the Avengers are able to take him down, Jan makes it a point to say that she believes Hank has snapped. 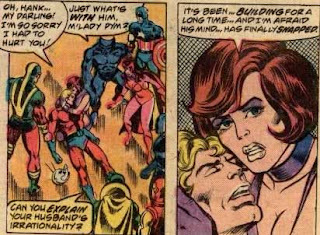 The Avengers restore Hank's memory, but further established the idea that Hank is a man with a mental illness and susceptible to mental breakdowns. And so it was that Yellowjacket became more and more violent towards everyone, including his wife. This brings us to AVENGERS #212, by Jim Shooter and Bob Hall, published in 1981. 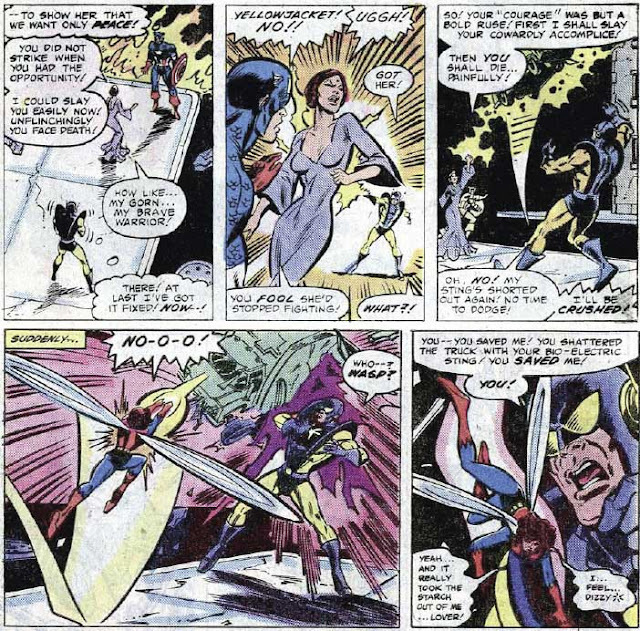 The Avengers have to head off to face a new villain named the Elfqueen, when Hank snaps at Jan. The idea of Jan being the underlying cause for Hank's insecurity, depression, and eventual breakdown is played upon through the entire issue, and is worsened when Jan saves him from a car the Elfqueen throws at him. This eats at Hank for the remainder of the issue, but he's got bigger problems. His unprovoked shot at the Elfqueen leads to him being court-martialed, with his Avengers membership getting put into question. Do note that he explicitly states that this is his first mission back, so that says to me that he was brought back for the express purpose of doing this story — a story about mental breakdown. You see, this is the thing that drives Hank over the edge. He's so driven to keep his Avengers membership that he comes up with the worst possible way to keep it. He creates a robot named Salvation I (Sal for short) to attack the Avengers during the court martial, so he can save them by blasting it in its vulnerable spot, which he, of course, designed. Does this sound like the actions of a rational human being? 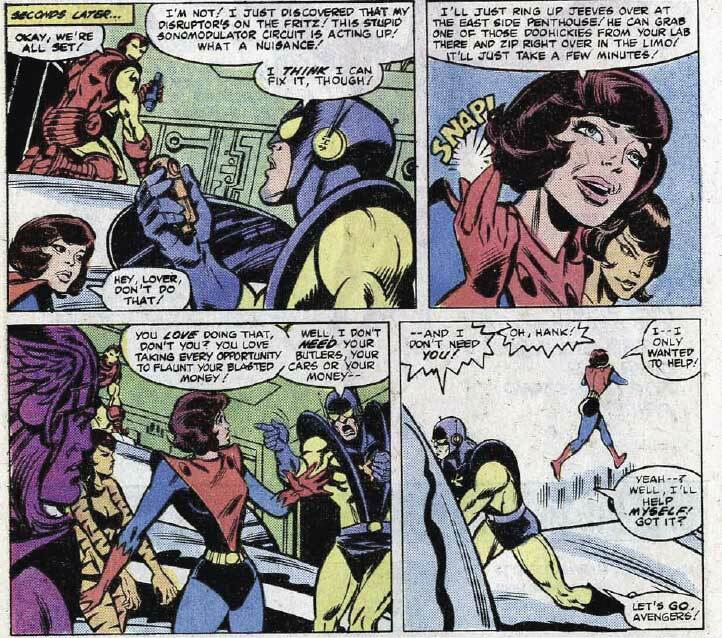 When Wasp tells him not to do it, that's when he slaps her. I've read that Shooter didn't script it to be a slap so much as a brushoff, and true to Marvel style, Bob Hall just drew it in as exaggerated a pose as possible, but I'm a "death of the author" type guy, so you have to go by what's on the page, and once again, I ask you, does that sound like the actions of a rational man? Let's look at how he defends himself at the court martial. So, he's pretty out of it, huh? I'm no psychiatrist (and frankly, neither are Roy Thomas and Jim Shooter), but this seriously looks like the 1980s equivalent of comic book temporary insanity. Somehow Hank hitting Jan is the panel everyone remembers — somehow, it's the one that stuck. He sicced a robot on the Avengers! He actually spent a night building a robot that would be invulnerable to the Avengers just so he could save them and be a hero. Yes, he hit Jan. But he attacked all of them. These aren't the actions of a hero — they're the actions of one seriously messed-up individual who needed professional help. So why does the slap endure? What makes it so defining? Why does that stigma get stuck to Hank to this day? 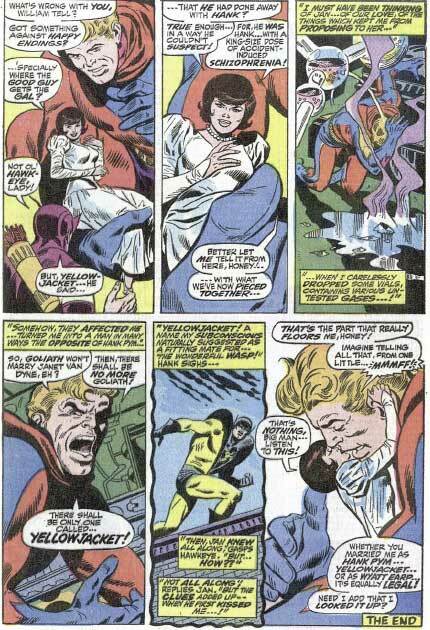 Because Hank Pym is a hero, and more, he's a hero in the Marvel Universe, where the heroes own up to their mistakes. The very next issue, he's not only asking for forgiveness; he's also acknowledging that he needs help. And when she won't give it to him, he leaves — he no longer deserves the help, in his mind. Things went even more downhill for Hank after this. He got manipulated by his old enemy Egghead into committing a federal crime. He was put in jail. 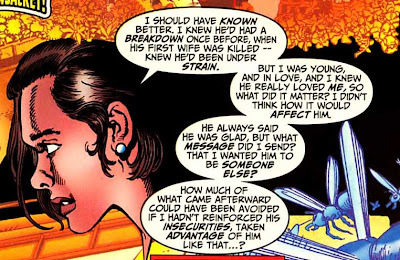 Tony Stark dated the Wasp while he was in jail (good going, Iron Man, you class act, you). On the day of his trial, Hank is kidnapped by Egghead, who believes that Hank is so far gone that he would be willing to join the Masters of Evil. Hank does, but then it turns out he's just playing along so he can build a machine that will let him beat down the Masters singlehandedly, which he does. And he does it not as Ant-Man, Giant-Man, Goliath, or Yellowjacket — he does it as Hank Pym. After this, he punches out Egghead, who pulls a gun at him. Hawkeye arrives just in time to shoot an arrow into it, which kills Egghead, but there's enough evidence in Egghead's lair to clear Hank. 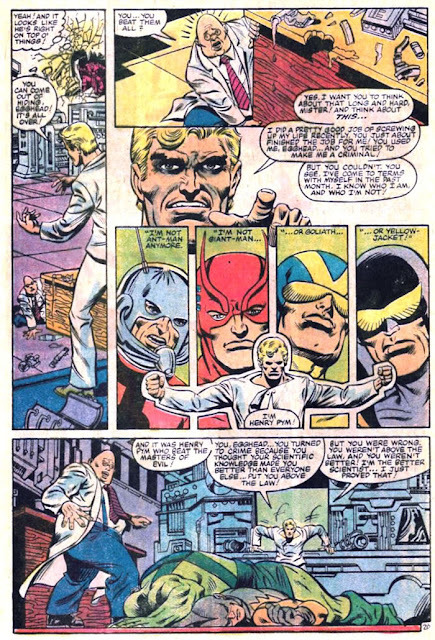 This may be Act 3 in most other stories, but not in the story of Hank Pym's fall from grace and eventual forgiveness. The third act is reserved for Hank forgiving himself and living with what he did. Since Egghead manipulated Hank, the Avengers are willing to give him the benefit of the doubt and ask him to go through a mental scan to see if his actions were caused by an outside influence. After he takes it, Hank gives off the defining line of the entire story. "I made my own mistakes, and I have to live with them." That says it all, right there. That's the story. And it's a Marvel story, because Marvel stories are, by nature, about their heroes screwing up and living with their mistakes. Spider-Man let a burglar go, who ended up killing his Uncle Ben. Iron Man made technology that was used for mass destruction, and he was an alcoholic for a while. Reed Richards, in his zeal for scientific knowledge, ensured his family would never have a normal life. Spider-Man may have been responsible for killing his girlfriend Gwen. In Hank's case, he has an illness, and that illness got the better of him, and he has to live with that every day of his life. 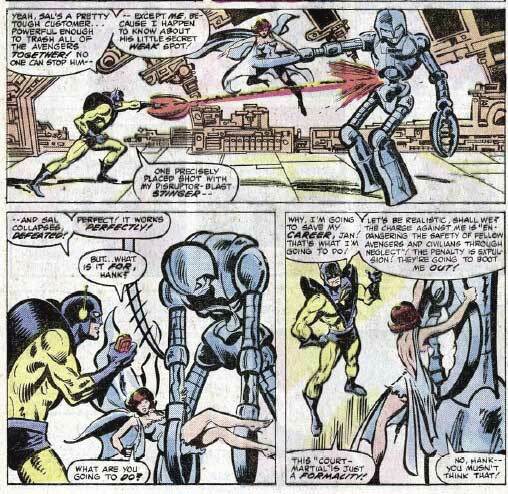 Henry Pym considers hitting Janet as the worst thing he ever did in his life — and this guy created Ultron, one of the Avengers' worst villains (if not the worst). 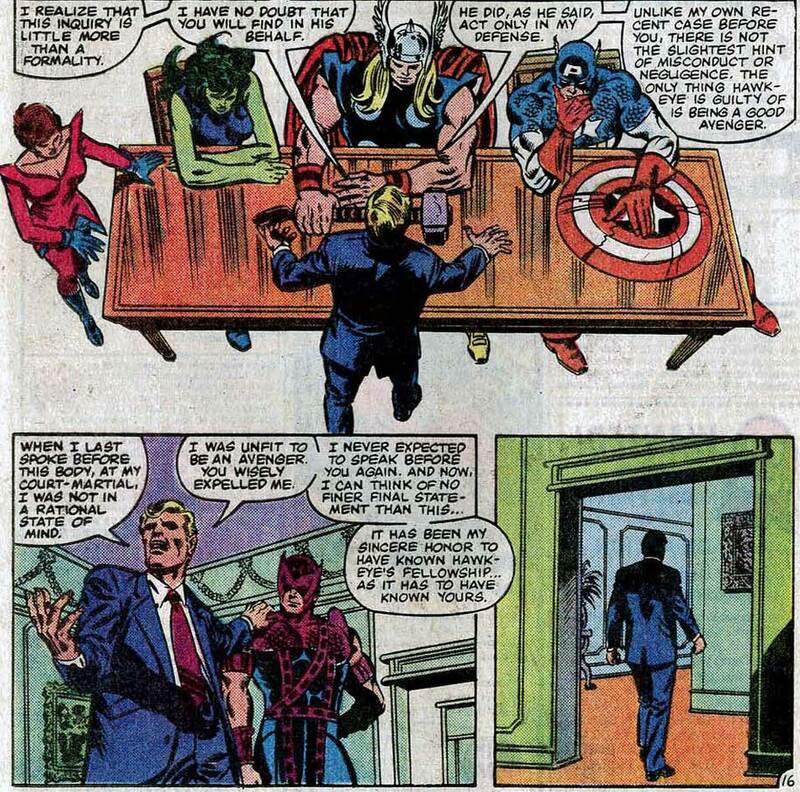 Getting back to the story, the Avengers have to hold a court martial for Hawkeye. It's just a formality, but Hank steps up to defend him. and second chances. Or maybe I just really like Hawkeye. 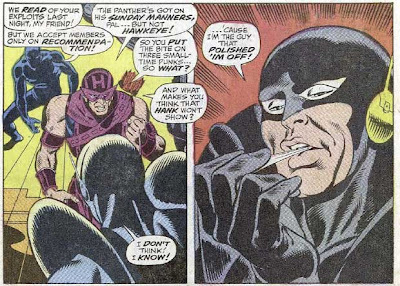 After the Avengers acquit Hawkeye, they go to apologize to Hank for not doing more to help him. Again, he takes responsibility for what he's done. someone close to them" story in as many years. Here's the first. And finally, he and Jan apologize to each other and make peace. In the years since, Hank would find the strength again to become a hero. He would join the West Coast Avengers, first as a consultant, then as a nonpowered operative. Eventually, he'd become Giant-Man again and rejoin the main Avengers team. And eventually, he and Jan fell in love again. Later writers would revisit this era frequently, precisely because it did define Hank so much — not that he hit Jan, but that he did it during a mental breakdown and has had to live with it for the rest of his life. I applaud Kurt Busiek for showing that it's not a black-and-white issue, that indeed Jan contributed to his breakdown. It doesn't excuse the slap, but it makes her grow as a character. And recently in ANT-MAN AND THE WASP by Tim Seeley, Hank pays tribute to the recently deceased Janet by opening up centers for victims of domestic abuse. So why does the slap endure? Because it is Hank's mistake. Because he's man enough to deal with it, to live with it, and to work towards redeeming himself for it. That's what the people who define him quickly as "wifebeater" don't seem to grasp — that it was the first act of the story. It was a story about his fall and his subsequent rebound. He has to live with his mistake every single day of his life, and the moment has defined him because he took responsibility for it and never stopped trying to make up for it. To casually dismiss Hank Pym as a wifebeater trivializes the entire concept of domestic violence, disregards the entire concept of mental illness, and is unfair to the story, the character, and to Marvel comics in general. 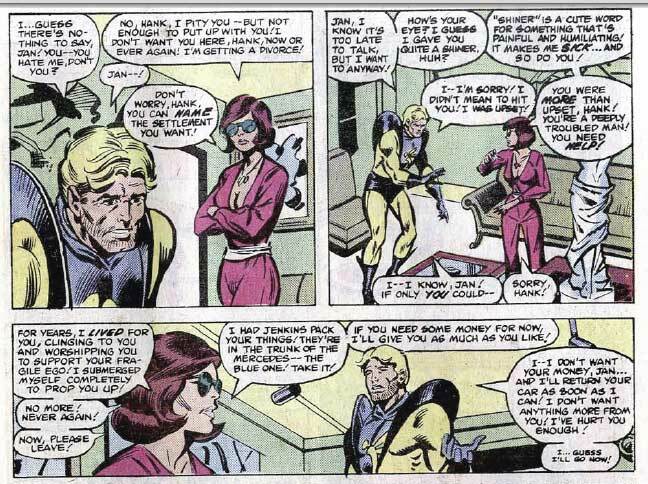 It's not a story about Hank slapping Janet; it's a story about Hank Pym making a series of mistakes and taking responsibility for it. In closing, I just want to say that if you're prepared to call any superhero who hit his wife once while suffering a mental breakdown a wifebeater, then you'd better be prepared to do it for everyone. So as a parting shot, here. Enjoy this sequence of Peter Parker, the Amazing Spider-Man, backhanding his wife across the room into a wall. His pregnant wife. I actually remember the reactions to this scene. Spidey inadvertently killing Gwen is enough for some fans. Maybe Spidey is too loved by fans and they're willing to forgive this. hey, Spidey tried to help the Jackal wipe out the human race after this. Special thanks to Debra, who helped proof this article; Back Issue Ben, who provided the necessary scans; and his wife Kimberly, the biggest Hank Pym fan on the planet! I love this article so much because Pym is awesome. He isn't given enough attention in the mainstream comics, been demoted to the C-list. 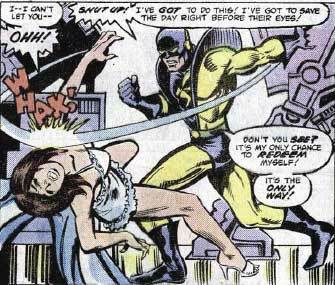 When I make wifebeater comments about Pym, they're in jest. And that's really my only excuse. Pym is awesome! 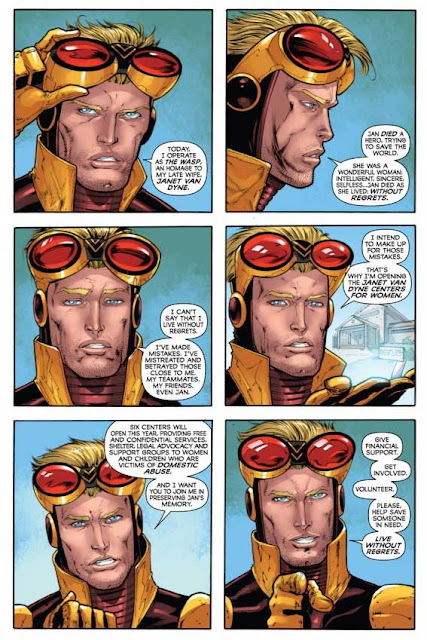 This was my first time really reading comics where he's the protagonist, just so I could write this article, and I never realized what a fascinating character he was. My pleasure, Kimberly. Thanks for introducing me to Pym's awesomeness. Excellent article, Duy! I've always liked Hank Pym, and I'm glad to see this matter addressed in such a thorough way. Probably the best article I've ever read in defense of Pym! He's always been my favorite Avenger (especially in his YJ identity) & always felt he's gotten a bad rap after reading issue #213 way back as a kid. The new Avengers cartoon goes a long way in redeeming the character & hopefully the 'Ant-Man' flick finalizes his comeback. Well researched & well-written! Thank you!! I can't see why no one up until now has attempted to reveal it as just another scheme of Ultron's, akin to his mentally controlling the butler Jarvis when in the guise of the "Crimson Cowl" (Roy really did do the definitive Hank didn't he)? Crikey, Justin Hammer had his scientists working over a long period of time to figure out a way to control Iron Man's armour remotely so what is so hard to believe about a robot with an Oedipus Complex scheming to make its "father" fall out of favour with its "mother" so it can step in and become the "surrogate" husband? If you're referring to the slap, I like that they keep it around. It's his lowest moment, and something that he's always going to work hard to redeem himself for. That he never will is part of the tragedy. Apparently, during Secret Invasion, they were trying to figure out how far back to go with Pym's retcon, and considered retconning the slap, but decided to keep it in the end. You appear to have overlooked the time that Hank was "de-evolved" into a Neanderthal in about Avengers #89, and struck his wife, kidnapping her as Ronan and the Kree tried to turn back the clock on the Earth. It was the very beginning of what has come to be known as the "Kree-Skrull War".